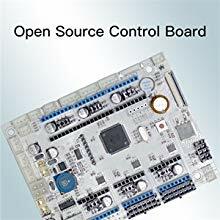 Geeetech A10M 3D printer, adopting new open source GT2560 control board V3.0, delivers mix-color objects and greatly enriches your 3D printing life. Keeping the good performance of its predecessor A10, it aims to provide users with quality printout and satisfactory printing experience. 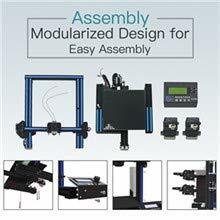 The modularized design provides you with an easier assembly experience. Its classic blue and black color combo imparts a touch of simplicity and excellence, embodying Geeetech’s commitment to quality products. Keeping Prusa I3 3D printers’ gantry structure and with its build volume as 220*220*260mm³, A10M makes the best of the building platform and enables you to view the printing details in 360°. Printing at the accuracy of 0.1mm, it delivers objects with smooth surface finish, clear angles and strong structure. 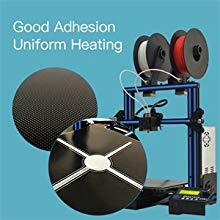 Besides, A10M comes with filament detector and break-resuming capability, greatly enhancing your 3D printing experience. A10M uses silicon carbide glass as its printing platform, greatly enhancing the adhesion of first layer and making it so easy to take down the print. Power Failure Recovery: The Power Failure Recovery function provides Geeetech A30 the break-resuming capacity. It is added to save real-time printing status and resume the printing job exactly at the same place where it has been stopped. This add-on totally drives away the hassle of repetitive and time-time consuming printing jobs caused by unexpected power outage. Totally get you out of worries about printing large-size 3D models. 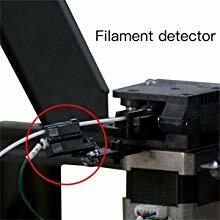 Filament Detector: Filament detector kills the pain caused by filament outage or fracture.The detecting system would alert you to change filament in case the printer would run in air or the spool is empty. 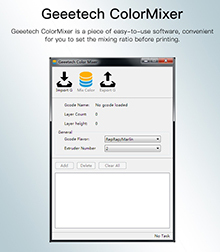 This add-on would avoid bootless printing as well as enhancing your printing satisfaction. 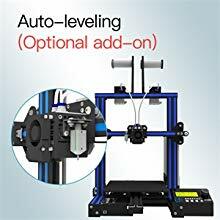 Optional Auto-leveling upgrade: no need for time-consuming manual bed leveling. ABS / PLA /flexible PLA/wood-polymer/PVA/HIPS/PETG, etc. EasyPrint 3D, Repetier-Host, Simplify 3D, Cura, Slic3r, etc. The Break-resuming function provides A10M to save real-time printing status and resume the printing job exactly at the same place where it has been stopped. This function totally drives away the hassle of repetitive and time-time consuming printing jobs caused by unexpected power outage. Totally get you out of worries about printing large-size 3D models. A10M extruder cover features 360°ventilation design, greatly enhancing the dissipation of heat and improving excellent printing quality. 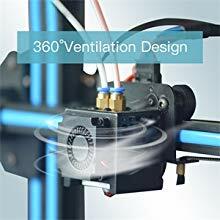 Filament detector kills the pain caused by filament outage or fracture.The detecting system would alert you to change filament in case the printer would run in air or the spool is empty. This add-on gadget would avoid bootless printing as well as enhancing your printing satisfaction. The main board of A10M is professionally coded to support auto-leveling function. All you need is to connect the leveling sensor with it. 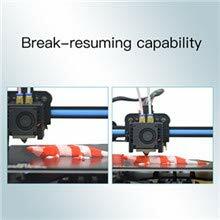 The whole operation process is effort-saving and would greatly enhance the adhesion of the first layer. A10M comes with Open Source GT2560 V3.0 control board which provides limitless space for you to modify the firmware at your will. 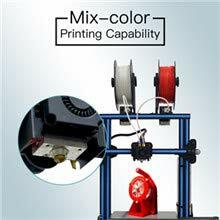 An active 3D printing community will also come into being with our concerted efforts. 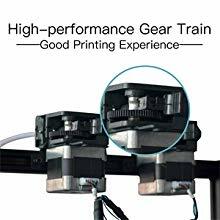 A10M extruder motor uses a gear train of 3:1 speed ratio, amplifying input torque and improving your printing experience. 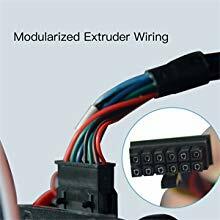 Adopting the modularized design for extruder wiring, A10M makes it easy to exchange the wire. The building platform has the features of High Adhesion and Even Heating. The hotbed heats evenly and can rapidly reach the target temperature. Because of the high adhesion coating on the building plate, it is easy to take down your printings when the hotbed cools off. 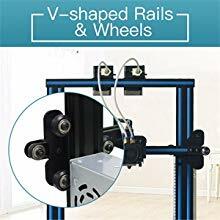 The V-shaped wheels and V-slot rails on each axis make the printing quieter, more stable, and more wear-resistant. This is my first 3D printer. I am still in the learning curve, but I think this prints very nicely for the money. I was holding out until I could get a dual color printer. I will probably build on this one with some upgrades and stuff, but as for first printers go... I like it. Had it built and printing in about 30 minutes after I got it. This is my second 3D printer. I purchased it because of the ability to print in dual colors. Delivery was quick and setup went smoothly. The instructions included were clear and accurate. The prints it produces are quite nice and the ability to gradually switch the color during the print opens up many opportunities. Currently Cura (the slicer I use) does not support the gradual switching of colors so it has to be done manually from the printer's LCD. Cura does support dual extruders and I have been able to slice and printer objects with dual colors in particular using a different filament for supports and the primary object. I am very happy with the printer and look forward to the slicers catching up to the printer's abilities. Awesome printer, lots of bang for the bucks. This was my first 3d printer and does take some extra effort since the profiles are not preset in Cura. I am very happy with this printer so far and 3dprintersbay.com got to me pretty fast, about two weeks from the time I ordered.